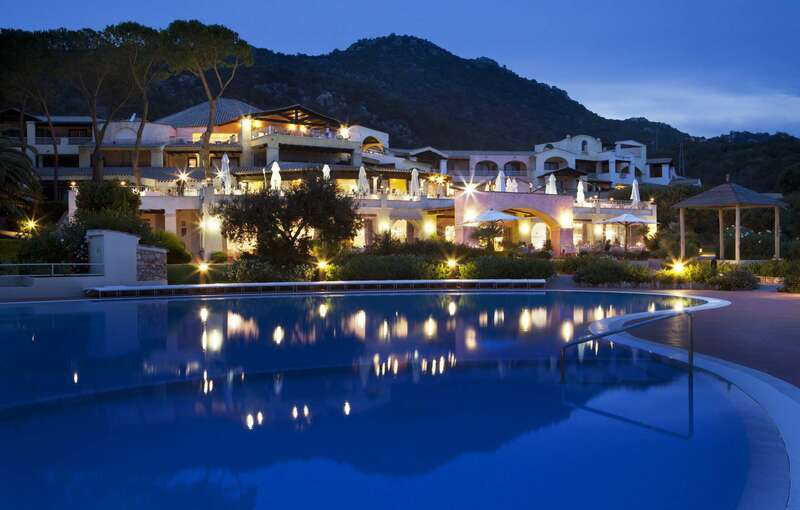 Sardinian Beach Hotel & SPA, elegant five-star hotel by the sea in Porto Rotondo. 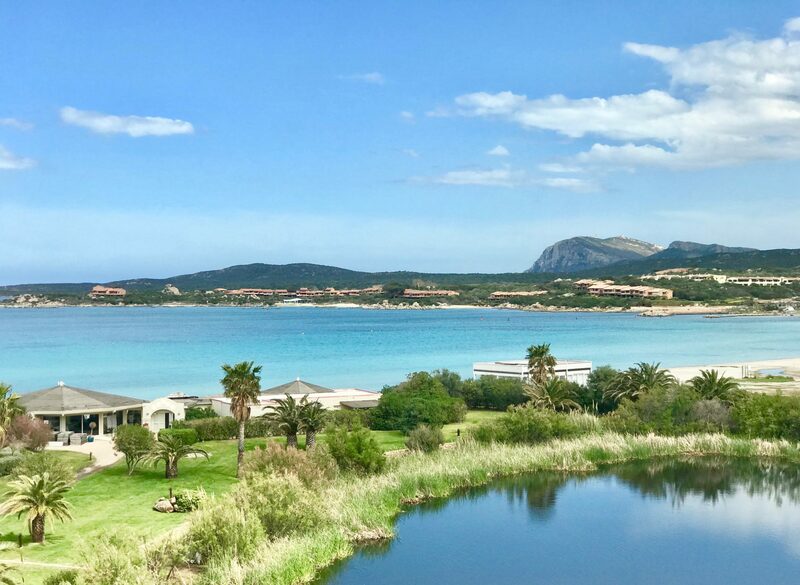 The Hotel Abi d’Oru, meaning “golden bee” in Sardinian has been creating 5-star relaxation and happy memories, imbued with that special Sardinian brand of warm hospitality, since 1963. 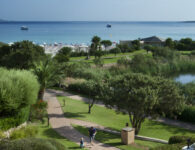 The hotel’s typical hexagonal pavilions are home to 160 rooms including 13 Junior Suites, 8 Classic Suites, 8 Deluxe Suites and 2 Presidential Suites as well as 2 restaurants, the Sardinian Gourmet Corner and common spaces served by 3 bars. Bee Happy Kids Club is a space where our little guests can have fun. A world specially tailored to kids, where they can make friends, play and get creative under the supervision of trusted professionals. Private gardens border the beach and include a natural pond, a large heated pool and a relaxation area with Jacuzzi and a modern spa opening onto the grounds. 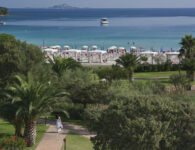 The hotel is 12 km from Olbia, 15 minutes from the airport. Small-sized pets that do not exceed 7 kg in weight are admitted. Pets might pass through but not stay in common areas and are not allowed in restaurants and bars. Hotel Abi d’Oru is not only a paradise for those who wish to enjoy the sea in relax with maximum privacy: your stay can become an opportunity to play sports, but also to choose from several tourist trips and cultural and gastronomic tours. 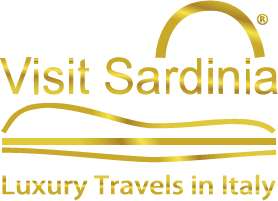 Sardinia is rich in history, archaeology, traditions, as well as local products, renowned all over the world: from Abi d’Oru you can easily get to all of this. A breathtaking landscape, the most precious thing we have. 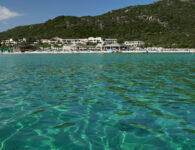 The hotel has 170 rooms, including junior suites and suites, and almost every room has a sea view. 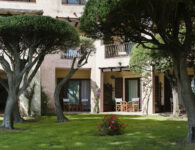 Decorated with curtains and bedspreads in typical Sardinian style, the rooms have a sea view or a balcony on the Mediterranean maquis of the surrounding hills or a patio directly on the garden lawn. The rooms are equipped with every comfort: air conditioning, satellite tv, telephone, mini bar, safe, hairdryer, beach towels and courtesy service. The suites are composed of two separate areas: bedroom and living room, with a surface that varies from 40 to 50 square meters. 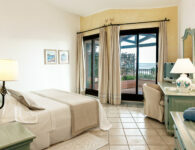 They can accommodate up to four people and are furnished in typical Sardinian style with warm and cozy colours. The suites overlook the sea of Golfo di Marinella through a balcony with chairs and table, where you can relax at sunset. Those on the ground floor have a patio that allows direct access to the garden lawn. 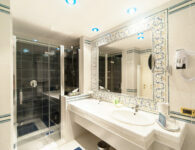 Suites are equipped with air conditioning, satellite tv, minibar, safe. Suites are available with a double bed or two single beds, perfect for families with small children or for those looking for a spacious and comfortable environment. These rooms are very spacious and allow to get beauty treatments directly in the room. For this reason they are also suitable for a bride preparing for her wedding gala. All junior suites have sea view and are about 30-40 square meters large, including a bedroom and sitting area, and a balcony with table and chairs perfect to relax at sunset. 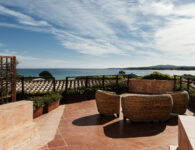 One ground floor junior suite has direct access to the lawn of the Mediterranean garden through a patio. They are all equipped with air conditioning, satellite tv, minibar, safe. Junior suites are outfitted with a double bed or two single beds. It is possible to have an optional extra bed or crib upon request. Why book a junior suite? 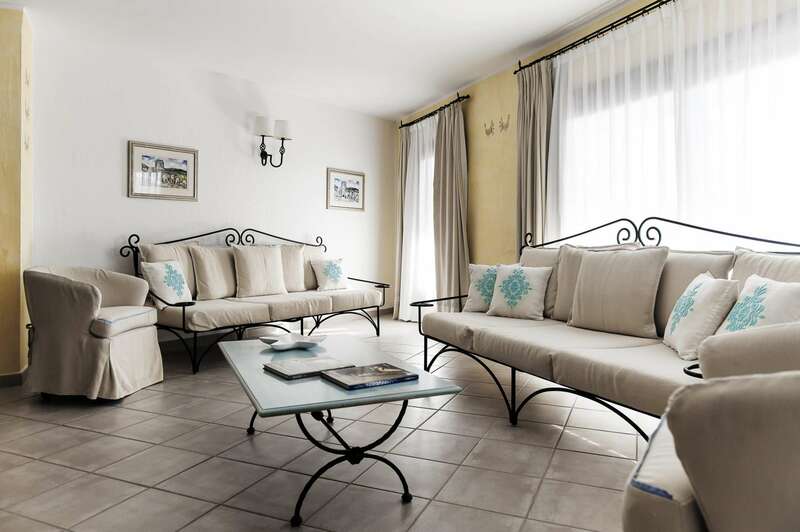 Sea side double rooms (18 to 25 square meters) face the sea of the Golfo di Marinella through a balcony or a patio area directly on the garden lawn. They are equipped with air conditioning, satellite tv, minibar, safe and outfitted with a queen size bed or two twin beds. It is possible to have an optional extra bed or crib upon request. Hill side double rooms (18 to 25 square meters) are equipped with air conditioning, satellite tv, minibar, safe and a balcony with view on the hills and the Mediterranean maquis of the Golfo di Marinella. They are outfitted with a double bed or two single beds. It is possible to have an optional extra bed or crib upon request. From time to time there are special offers on these rooms. Hill side double rooms (18 to 25 square meters) are equipped wiith a bathroom with facilities suitable for disabled people. 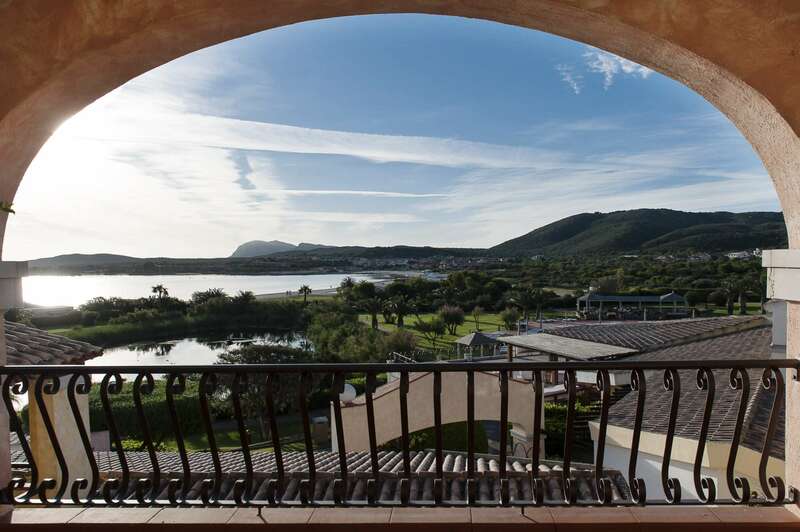 There are also air conditioning, satellite tv, minibar available, and a balcony with view on the hills and the Mediterranean maquis of the Golfo di Marinella. They are outfitted with a double bed or two single beds. It is possible to have an optional extra bed or crib upon request. >From time to time there are special offers on these rooms. Three bars serve tasty snacks, original cocktails and delicious refreshments. 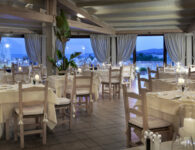 One is located in the lobby, with a terrace overlooking the sea, and in the evening live piano music is available. The wonderful panoramic position is ideal to sip a cocktail at sunset or after dinner. The second bar, by the pool, offers traditional coffee bar refreshments and a wide selection of aperitifs, snacks, smoothies, fruit and Ice-creams, that you can enjoy while relaxing on the sun loungers at the poolside or on the lawn. 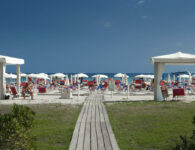 Beach service with sun beds and umbrella is available. 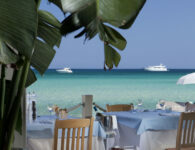 The hotel has four restaurants, two in the central body and two on the beach, one of which is also open to outside guests. In our restaurants the dishes of the Sardinian tradition and international cuisine coexist, blending the goodness and wealth of raw materials offered by the local territory. 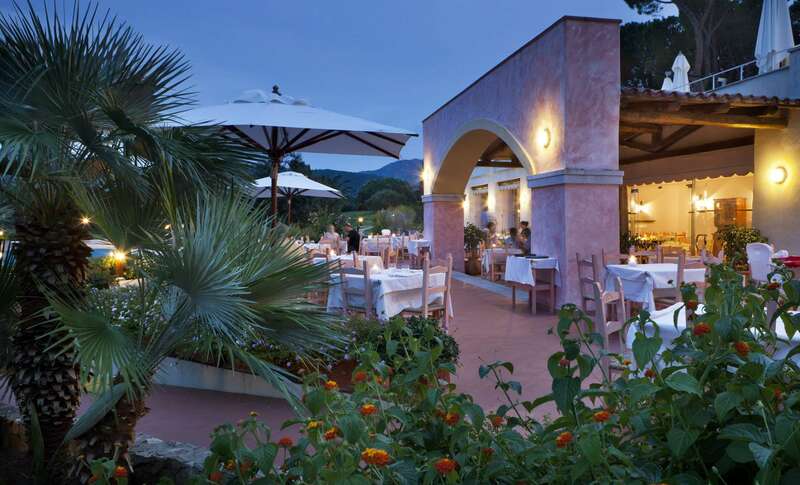 Guests can choose from the simplest low-calorie dishes and grilled meat and fish, cooked at the moment and in front of the guest, and the more sophisticated menus offered by the restaurant I Fenicotteri, together with delicious pastry desserts and an extensive wine list. 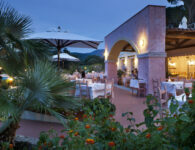 The culinary offer is very rich and guests only have the pleasant task of choosing. (In case of allergies or food intolerances, it is possible to notify the hotel by calling or sending an e-mail at: info@hotelabidoru.it). 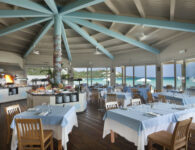 It is the main restaurant of the hotel and it is open since early morning. 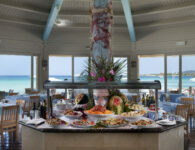 At the breakfast buffet you will find sweet and salty food, cold and hot drinks, with table service. In the evening it offers a buffet for appetizers, pastry, fruit and a daily menu with first and second courses served at your table. 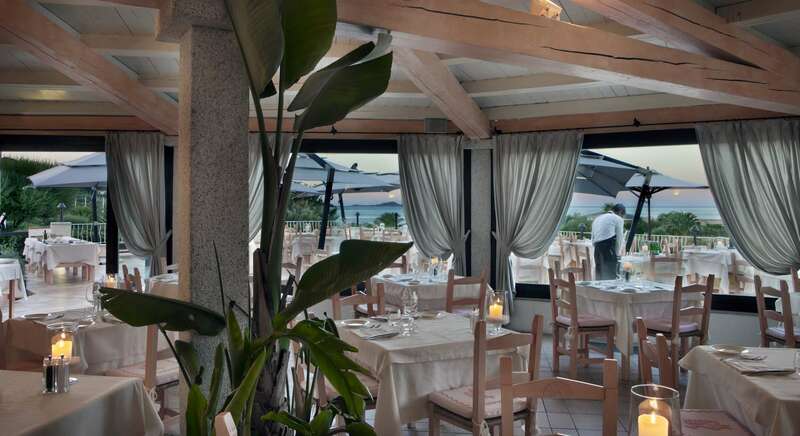 The restaurant also has tables on the terrace, facing the sea of the Golfo di Marinella, a few kilometers away from Porto Rotondo. Marinella, a restaurant in an enviable location by the beach, offers lunch buffet and grilled specialities, prepared right in front of our guests. 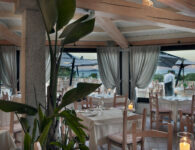 While sitting at the tables of Marinella, you are so close to the sea that you might almost feel your feet in the water. Marinella is the perfect choice for a quick break from your day at the beach. The snack bar restaurant Il Marinaio, on the beach, is also open to outside guests and it’s the ideal place for quick meals by the sea serving pizzas and light lunches so you don’t waste time and can get back and enjoy the sea all day long. 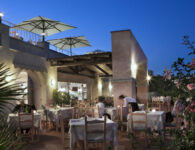 The grill restaurant Il Laghetto is located by the swimming pool, with outdoor seating also available. It offers a buffet dinner service with show cooking, guaranteeing a fast casual environment, beloved by families with small children or guests who prefer quick and informal meals. If you want to spend the day of your wedding kissed by the sun and pampered by a light breeze, the Hotel Abi D’Oru is the golden location you are looking for. With its beaches and its unique design, the hotel will give to your event a magical and unforgettable atmosphere. Give free rein to your imagination: you can organize your wedding on the white sandy beach of the Gulf of Marinella, by the pool or in the luxuriant parkwith a pond. Possibility of wedding menu, customizable in its entirety, including the wedding cake and the handmade patisserie with its irresistible flavor. A romantic wedding on the beach of the Golfo di Marinella. Your dream wedding on a white sandy beach in front of a crystal clear sea can come true. – beauty treatments and hairstyling for both bride and groom and for their guests. An refined wedding in the hotel gardens. Your dream wedding is possible in the enchanted frame of our gardens, among palm trees, flowers and a pond. 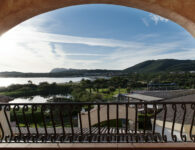 For your guests: for a minimum of 5 rooms, double room starting from € 190 per night including breackfast. An elegant wedding in the simplicity of our tradition. In the months of May and October, our beautiful island, rich of wild nature and traditions, will offer the perfect scenery to your event. – for the newlyweds: Superior room front sea view (upon availability) including breakfast for the first wedding night; a special gift from our hotel: Sardinian wedding rings with silver filigree.